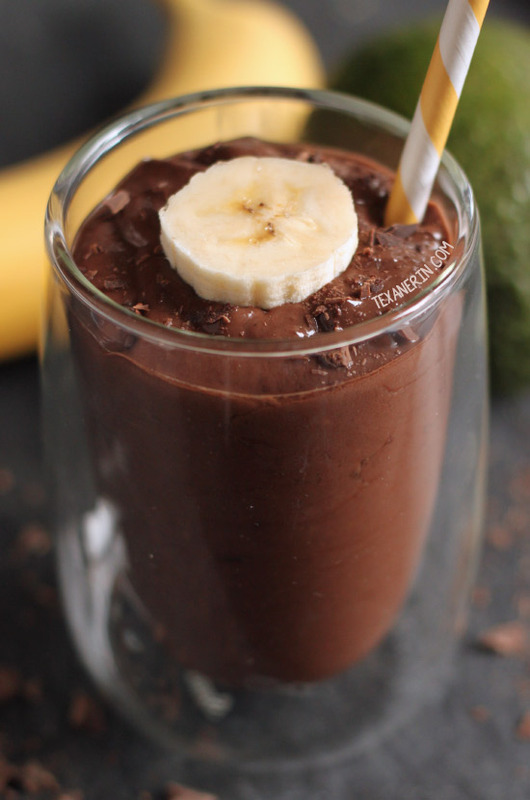 This chocolate avocado smoothie is super healthy, quick, simple and ultra creamy! Doesn’t taste a bit like avocados and can also be made as pudding. 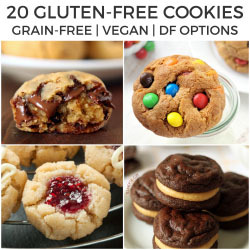 Naturally gluten-free with paleo, vegan and dairy-free options. So for about 6 weeks, no matter where I went shopping, all I could find were rock hard, awful, turned-rotten-before-ripening avocados. As soon as the good ones returned, I just had to go and buy six of them. About a year ago, I was extremely dubious of this whole avocado in sweets thing. I thought those people eating avocado pudding were a bit daft, to put it quite nicely, but they had just seen the light before I had. Avocados in smoothies and desserts just works. If you haven’t tried it, you definitely should! This avocado banana orange smoothie is a great place to start! These healthier raspberry truffles, chocolate peanut butter pudding, and raspberry avocado smoothie are also great choices. This chocolate avocado smoothie is almost on the verge of being pudding (I have another avocado pudding recipe you might like – this chocolate raspberry pudding). Actually, if you want pudding, just leave out the milk. And if you want this more liquidy like smoothies normally are, just add more milk and it’ll be thinner. I sometimes see smoothie recipes with ice called for, but I never use it in my smoothies because I don’t like my smoothies icy. I like them like slightly runny yogurt. And creamy! This is super creamy with a banana and half an avocado in it. 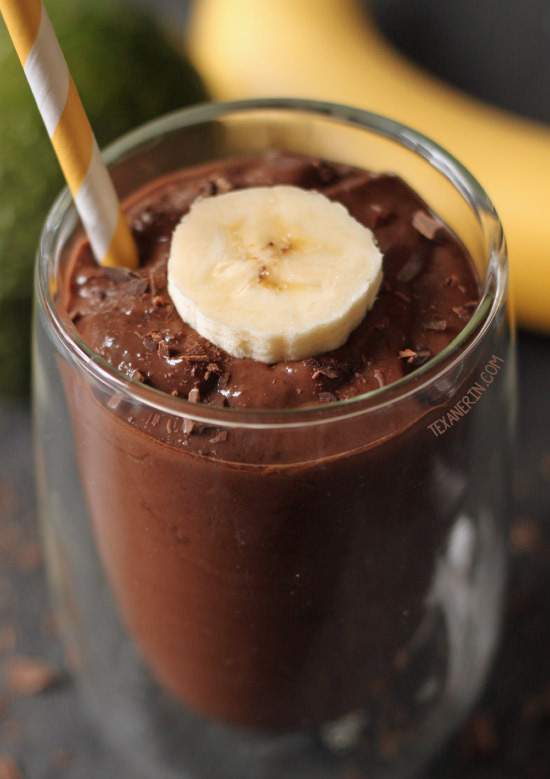 You can leave out the banana and have it just chocolate and avocado, but the problem with this is that you need a lot more added sugar to make up for the banana. Those suckers are just full of natural sweetness! Don’t have an avocado on hand? Try my chocolate cherry smoothie! This sunshine lemon smoothie from Wishes ‘n Dishes sounds amazing as does this rise and shine smoothie from A Beautiful Plate. Blend everything together in a food processor (or a blender if you have a very good one - mine requires too much liquid for a thick smoothie like this) until it's very creamy. Add more milk until it's the desired thickness. Coconut cream (from a can of refrigerated canned coconut milk) or coconut milk yogurt will yield a thick smoothie like you see but you could also use coconut milk for a thinner version. 176 comments on “Chocolate Avocado Smoothie (paleo, vegan, dairy-free options)” — Add one! I just discovered the magic of frozen avocado slices so I could make this every single day if I chose to! And I just might – can’t go wrong with chocolate. YUM! Hi,this is the first time I visited your website and I found your cholate avocado banana smoothie recipe,I copied your recipe and I just made it in my magic bullet blender.My mom and my brother’s new wife had a taste of your smoothie and they love my smoothie.i am now drinking your smoothie and it tastes really good and I love and enjoy drinking it. I put chocolate agave in the smoothie along with the rest of the ingredients. Hi Kim! I’m happy to hear that the smoothie was enjoyed. :) And good to know that it works well in a Magic Bullet! Thanks a bunch for your comment. 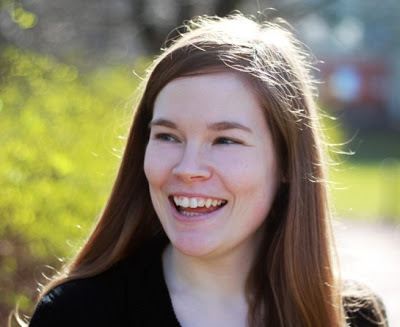 I hope you’ll find some other recipes to try out! I loved this! I’m just beginning to try avocado smoothie recipes and saw this one and just had to try. So glad I did it was delish! I added 1 tbsp maple syrup to add just a touch of sweet and it was perfect! Thanks so much for this wonderful heart healthy recipe! You’re welcome! I’m so happy that you liked the smoothie. A little extra maple is never a bad thing. ;) Thanks for your comment! Loved this! I added a spoonful of honey to sweeten mine up! Whoa!! Now this was a huge hit with my very fussy, autistic son! Wonderful way to cram in some awesome nutrients without them realizing! We used frozen bananas and 2 tablespoons of honey, cultured coconut and fortified almond milk to make it GF & DF. This is going to be a staple for or “treat” menu! That’s awesome! I’m so happy that you found something your son can enjoy and that fits his diet. :) Thanks a bunch for your comment and for sharing your adaptations! I’m surprised how filling it is! Had it after I went to the gym yesterday (so I’m definitely gonna try to protein powder version as well!) and I was full the whole night. Such a great recipe. Thank you!! De-lish! I used whole fat coconut milk and a tad of chocolate almond milk with a bit of honey to sweeten it a bit. My avocado was not very ripe and I used a very old frozen banana. Absolutely delicious, even the kids wanted one. Yay! I’m so happy that you and your kids enjoyed it. And awesome that you found a use for that very old frozen banana. :D Thanks a bunch for your feedback! Add in a scoop of protein powder! You won’t regret it! It mixes so well with this smoothie and gives you an extra boost! This was SO GOOD. I dreamt about it all morning, heh. I did feel hungry pretty soon after that, though, will try to put more greek yogurt next time. This was delicious! It would solve any chocolate craving. I threw some chia seeds in as well to give it a bit of protein boost. Thanks for the recipe! I’m sure it would, too! I just like the dark chocolaty-ness that the Dutch-process adds. :) Thanks so much for your feedback! Yup! As far as I know, sweetened cocoa powder is only intended for making hot chocolate. Hope you’ll enjoy the smoothie! These recipes will be such a blessing when I have surgery on my esophagus next month. I will have to be on a liquid diet for a week and a soft food diet for another. It was that week of having a liquid diet that was a cause of concern. The dietician recommended lots of jello, pudding and ice cream, etc. I felt like I had a sugar-high just reading the list of allowed foods. The only healthy options offered chicken broth, yogurt and lots of milk….sigh. Yes, I will need to tweak things just bit with some of these recipes. I will strain the orange juice for the Orange Banana Smoothie and substitute a wee bit of orange extract for the orange zest. The raspberries will also need to be strained for the Raspberry Smoothie. But those are easy adjustments. The Chocolate Avocado Smoothie is good to go as it is. And it is SO delicious! Upon researching nutritional info, it was delightful to find that the avocado will bring some much needed protein and fiber into what was a nutritional abyss. That diet sounds like it’d be fun for a day and then even I would get sick of all the sugar. :( I’m so happy that you’ve found these recipes so that you can have something with a little nutrition for that first week! I like your ideas on making the smoothies liquid diet okay. :) Thank you so much for your very kind comment and I wish you a successful surgery and a super quick recovery! I always eat avocados in sweet things. It’s really common to eat them that way in my home country. In fact it’s a little bit weird to eat them in savoury things for us. There are a lot of restaurants in my country selling “jus alpokat” which means avocado juice. No banana and milk are included. Just avocado, sugar, water, and ice. Usually we add liquid coconut/palm sugar or chocolate sauce on top of it. It’s really yummy. Sometimes we chunk the avocados, add the liquid coconut sugar, then just eat them that way. Sometimes we mix them in our tradisional sweet dessert. So this is not a new thing for us actually :). I’m happy that you also like it. That juice sounds good! And I didn’t even know that liquid coconut sugar was a thing. Thanks for the tip! The only way I’ll eat avocados is in sweets. I don’t like the flavor so sugar and cocoa powder help cover up the taste. ;) Thanks so much for your comment! What is the importance of using DUTCH Cocoa? Can i use regular Hershey’s or is it not the same?? Erin replies to Angie W.
Dutch-process isn’t necessary here but it’s the only cocoa powder I have access to so it’s just what I always list. Regular Hershey’s will work here. It won’t be as dark or chocolate-y but it’ll work. ;) There’s some more info on Dutch-process cocoa powder here if you’re interested! While it’s not important for this recipe, it does amazing things for baked goodies. Candace replies to Angie W.
Hey! I was going to make this and then freeze it into Popsicle molds. Do you have experience with freezing avacados? Do they stay somewhat soft (similar to bananas? My goal is to make it like a fudgesicle! Kind of in love with this idea! I think I would mash the avocado and freeze it into ice cubes to make it super cold. Thank you for the recipe! Hi, what are the nutritional facts for this smoothie partially? But even all of them? Thank you. Just made this tonight and loved it! I used whipped creamy cottage cheese instead of yogurtand it turned out like pudding! So, I served it with a little whipped cream as dessert! That sounds amazing! I’d never heard of whipped creamy cottage cheese. Interesting! Thanks so much for the tip and the feedback. :) So happy that you liked it! Hi, I lie the look & sound of your smoothies, especially the chocolate one! However I too have an allergy to bananas & therefor have had to miss out on some very nice smoothies. How did you come to realise you could eat certain bananas & is it a particular one please. I need to be very specific as my allergy so far does not in any way tolerate even the slightest hint of banana. Thank you for any help you can give me. It would make my day to be able to drink one of your smoothies. I’m afraid there’s no specific type of banana I can eat. It sounds like my banana allergy isn’t nearly as serious as yours. So up until recently, eating bananas would make my throat and ears (or rather, the inside of my ears?) really itchy, give me a drippy throat, and sometimes it’d develop into something like a little cold (without the coughing). Why I can eat bananas now I have no idea. But every now and then, I’ll eat one and have the same weird reaction. The next day, I’ll eat another from the same “batch” of bananas and not have the problem. Have you tried avocados? They’re great for smoothies! But I’ve heard that people who are allergic to bananas are often allergic to avocados. :( So sorry I couldn’t help more! I totally get how bad a banana allergy is when you want to eat healthy. Very frustrating and annoying! Have you tried organic bananas? Hehehe. Shooting bananas sounds fun! :D So happy that you liked the smoothie. Thanks a ton for the feedback and the rating! This looks great! Fortunately, I have all the ingredients, so I’m gonna make this for lunch. I’m lactose intolerant, so I’m substituting Greek yoghurt for soy yoghurt and the milk for soy milk. Do you think it’ll still work? I thought this was really yummy! Mine looked lighter than yours. Reminded me of chocolate mousse. My daughter thought it was too bitter. My husband thought it tasted like vegetables. More for me! I can see bitter if you didn’t add a lot of sweetener but vegetables? Haha. Well, like you said, more for you! :) I’m so happy that you liked it. Thanks a ton for the feedback! I just got a whole bunch of bananas and I freeze them too but WITHOUT the peel. Just put them in a container and scoop out what you want when you make your smoothies. I’ll go back to the store and pick up the avocados. I love to try anything chocolate on your site. YUMMO! Thanks for the healthy idea for bananas, avocados and chocolate. Sounds great! I just freeze my bananas whole in the peel — then when you defrost you have a lovely sweet liquid with the banana flesh that helps to sweeten recipes — I can have absolutely no sugars (I have too much insulin) but I can use banana or applesauce in my baking with no adverse reaction — love your recipes. This came out grt, it was a little bitter for my taste so I sweetens it with clover honey. Delish! I just tried this and it was delicious. I added a little unsweetened almond milk the recipe. I also added honey as it was a little “bitter” to me as well. Very good. Thank you! I’m happy it came out well! And you can never go wrong with honey. ;) Thanks so much for your feedback!